In this June 7, 2017 file photo Jason Aldean performs during a surprise pop up concert at the Music City Center in Nashville, Tenn. Aldean was the headlining performer when a gunman opened fire at a music festival on the Las Vegas Strip on Sunday, Oct. 1. Just hours after a gunman opened fire during the Route 91 Harvest festival on Sunday, Jason Aldean turned to Instagram to check in with fans and call for prayers. 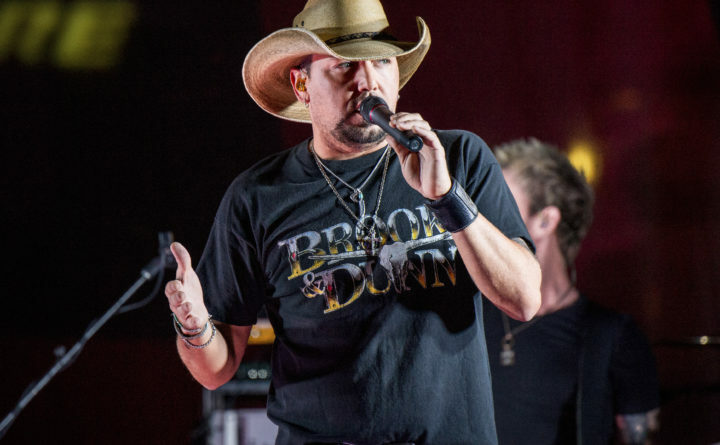 Aldean had been in the middle of his set as the first shots were fired and he and his band were quickly removed from the stage as the panicked crowd dispersed. “My Thoughts and prayers go out to everyone involved tonight. It hurts my heart that this would happen to anyone who was just coming out to enjoy what should have been a fun night,” the country music artist concluded. Aldean’s words echoed those of Ariana Grande in the aftermath of the Manchester, England, bombing in May, which targeted fans as they left Grande’s concert. Twenty-two people were killed and more than 250 were injured in that attack.